Breaking records and ridding himself of jinxes that have plagued him thus far  that's what Sebastian Vettel seems to be doing in his 2013 season of Formula 1. Now, having won the German GP, and also having won a race in July, both of which evaded him in the seasons up to 2013, Vettel has set his sights on the Hungarian GP. Of his seven assaults on the Hungaroring, Vettel hasn't managed to get onto the top step of the podium a single time. A win here this weekend could mean that he cements his stranglehold on the 2013 season before F1's four-week break ahead of the Belgian GP. But does it look good for him? Well, the early indicators show that it could well be the German triple world champion on the top step of the podium. After all, at the recent Young Driver Test held at Silverstone, it was Vettel who managed to climb to the top of the timing charts. The extra running time he got on the Pirellis will also mean he has an advantage going into the race at the Hungaroring. Something that Mercedes, significantly, will not have. Vettel and team-mate Mark Webber, have also led the Red Bull team to a one-two at the first practice session at the Hungaroring. However, it's one of the Mercedes drivers who, of the current crop on the grid, has had the most success at the Hungaroring. Lewis Hamilton has won at Hungary thrice, one short of the most successful driver at the track, Michael Schumacher at four wins. Whether Hamilton will do well at Hungary this year, however is questionable. If there is a Mercedes on the podium, it is more likely to be Nico Rosberg. While Rosberg has less points than Hamilton, he has the confidence of having won two races this season. Of course, none of this will matter if Mercedes isn't able to get their rear tyres to perform at optimum levels. The Silver Arrows have struggled through the season with overheating issues with their Pirelli rears, and temperatures at the Hungaroring are expected to soar. At the first practice session at the Hungaroring, Nico Rosberg finished seventh on the timing sheets, while Hamilton only managed 13th. For the Silver Arrows, Hungary could be a very trying race. On the other hand, though, is the fact that Hungaroring has also been the site of some key wins for some unlikely people. Indeed, it was there that Fernando Alonso scored his first ever race win in Formula 1 back in 2003. And a year ago, when the F1 circus showed up at the track, it was Alonso who was at the head of the F1 championship standings. 2013, though, looks like an entirely different matter. A Ferrari victory, at the moment, looks very unlikely. Who, then, has what it takes to challenge the mighty Red Bulls at the Hungaroring? Let's think. It would take a car that would do extremely well in hotter climes, a car that was easy on its tyres, if you will. And, especially when it comes to the 2013 season, that car has undoubtedly been the Lotus F1 car piloted ably by Kimi Raikkonen and (not so ably) by Romain Grosjean. 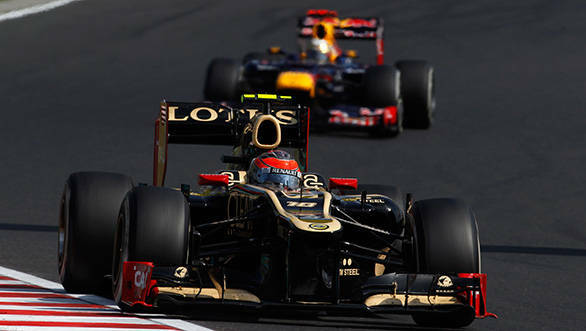 At the last Hungarian GP, finishing second and third behind Hamilton, were the two Lotus' of Raikkonen and RoGro. With Hungaroring being one of the hotter tracks on the 2013 calendar, and Lotus having done well at all the hot tracks this season, we're almost certainly looking at one, if not two, black and gold cars on the podium. But the real star of the 2013 Hungarian Grand Prix will be the Pirelli tyres. Whether they perform spectacularly or disastrously, they will certainly be the talking point of the race. Now to wait and watch for what Pirelli has brought to the races this weekend!